Throughout its history, a pattern has repeated itself in forming the population of Spain: the entry of European peoples into the northern regions and of African peoples into the southern regions. The earliest inhabitants of the Iberian peninsula left traces that go back at least to 580,000 B.C.E. (In Spanish, this date is written 580.000 a.C.; notice that the Spanish numeral uses periods instead of commas; the abbreviation indicates the words "antes de Cristo" or "before Christ," still the traditional way to indicate dates in Spanish history. The initials "d.C." indicate the words "después de Cristo" or "after Christ."). 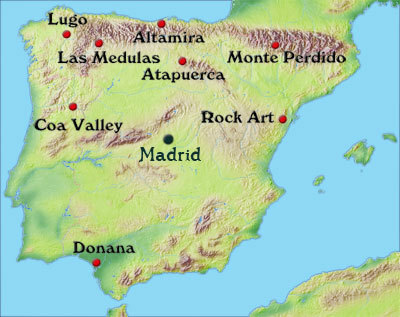 Pre-historic populations left a wealth of archaeological evidence in Atapuerca and Altamira. 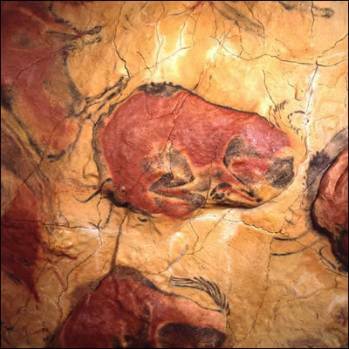 An image of the cave paintings in Altamira -- notice how the painter has taken advantage of the shape of the stone to give dimension to the charging bison. The burial caves at Gran Dolina in the Atapuerca region contain the bones of pre-Neanderthals humanids that may be up to a million years old. Famous cave paintings of early homo sapiens in Altamira date between 16.000 a.C y 9.000 a.C. Both of these ancient sites are in northern Spain, reflecting migration of populations pushed from Europe by the glaciers of the last Ice Age over the Pyrenees mountains into the peninsula. You can see a reconstruction of parts of the Altamira caves at the National Archaeological Museum in Madrid. The Iberians (los Íberos) immigrated from northern Africa or the eastern Mediterranean and settled in the south and east of the peninsula now called by their name. They were a pre-Indo-European people who may have entered Spain as early as 4.000 a.C. and spread from the coasts inward. The Vascone people, the ancestors of the Basques in northern Spain, may have been an Iberian tribe. 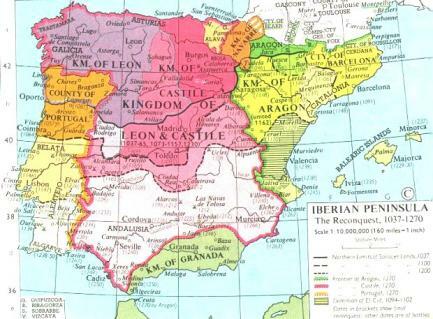 In any case, the languages of the Iberians and the Vascones are not related to the Indo-European languages, and although the Basques preserve their language to the present day, in the rest of Spain, the Iberian language became extinct after being replaced by Latin in the first and second centuries C.E. (d.C.). 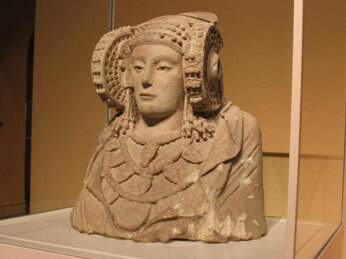 One of the most beautiful artifacts of the Iberian culture is the Lady of Elx (la Dama de Elche), currently on display in the National Archaeological Museum in Madrid. This lovely and mysterious sculpture probably dates from the fourth century B.C.E. Its purpose is unknown, although it may be a funerary urn, a use suggested by a cup or cavity in the back of the sculpture that may have been used as a recipient for the ashes of the deceased. Discovered by a worker at an archaeological site in Valencia in 1897, the lady has since had a busy life, appearing for years at the Louvre in Paris after her purchase by a French archaeological connoisseur, going into hiding for safekeeping during the Second World War, returning to Spain in 1940, where she first was displayed in the Prado Museum and subsequently moved to her current home in the National Archaeological Museum. 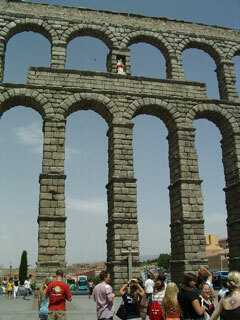 Her fate is not yet settled, however, as there is a movement to return her to her home in Elx, or Elche, in Valencia. 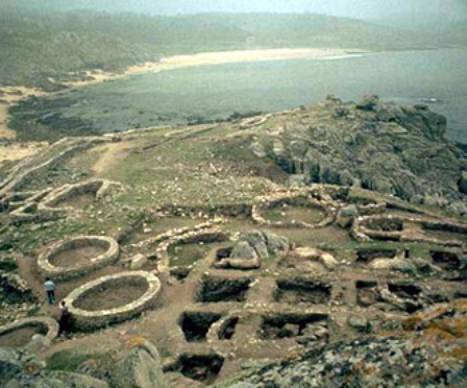 The Celtic tribes (los Celtas) entered the north of Spain by 1200 B.C.E. and spread southward. 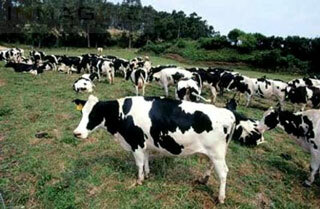 The brought a culture based on settlements of cattle-raising pastoralists protected by a warrior elite. In northern and western Spain, they built settlements to defend their grazing land, referred to as castros, walled villages with round houses and hill-forts. 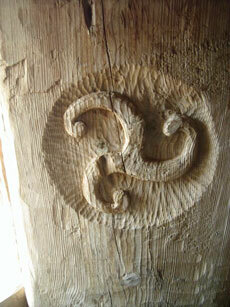 The Celtic tribes and the Iberian tribes intermingled and formed the Celtiberian people. Their legacy survives today not only in archaeological sites but also in the continuing importance of grazing animals in the north of Spain. Spain abounded in gold, silver, tin and copper. Tin was important for the production of bronze, naturally of great importance in the Bronze Age. The Greeks, Phoenicians and Carthaginians competed for the rich resources of the peninsula and founded colonies along the southern and Mediterranean coasts. and Portugal. The Phoenicians had arrived by 1100 B.C. 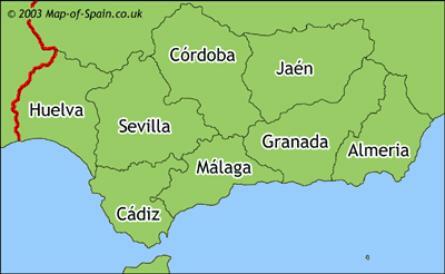 ; their most important colony was Gadiz, now called Cádiz, possibly the oldest city in Western Europe. 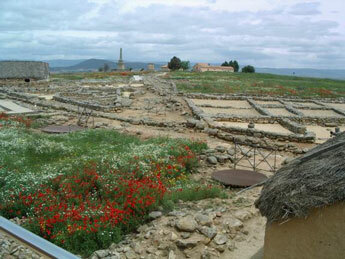 An early semi-legendary people established Tartessos somewhere in the south of modern Andalucia. The city disappeared suddenly and mysteriously in the sixth century B.C.E. 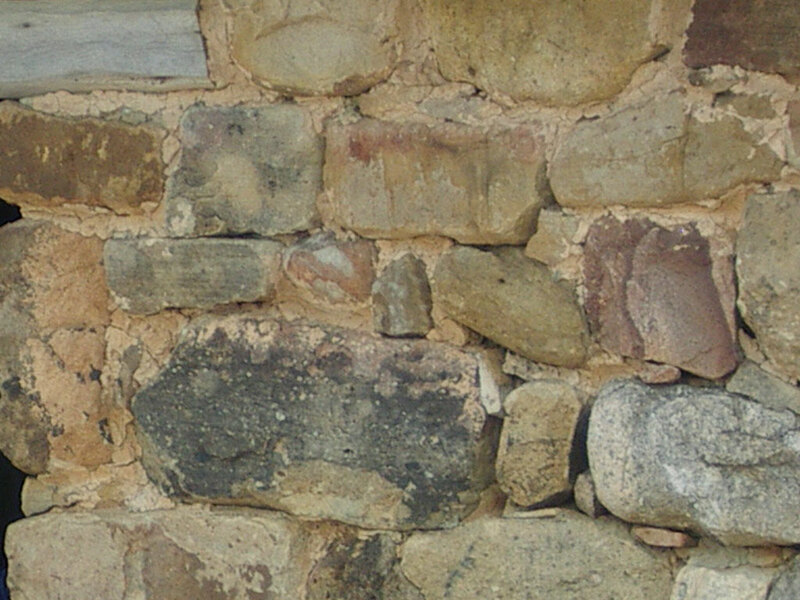 Tartessos appears in several ancient accounts of the Greeks and Romans; the oldest known indigenous texts of Iberia (stone stelae of the 7th or 6th century B.C.E.) are in the Tartessian language. 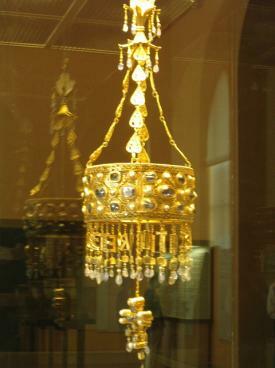 The Tartessians were traders with a reputation for great wealth. They acquired tin through trade with the Tin Islands (Britain, specifically Cornwall) and by panning in local streams. 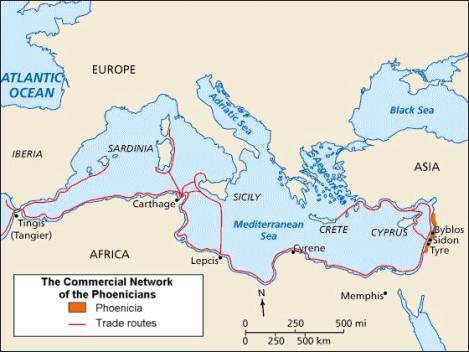 The Tartessians traded with the Phoenicians and possibly were wiped out by the Carthaginians in the competition for the mineral trade. Their descendants were the Turdetanos who inhabited the valley south of the Guadalquivir river in present-day Andalucia. Carthage, originally a colony of the Phoenicians on the coast of Africa, in what is now Tunis, was the dominant power in the Mediterranean in the third century B.C.E. The most important Carthaginian colonies were the island of Ibiza and the city of Cartagena (the name of which means "the new Carthage"). This map illustrates the distribution of languages in pre-Roman Spain, and provides some insight into the distribution of the Celts, Iberians, Vascones, Greeks and Phoenicians, as well as into the linguistic variations that persist into modern times. The green areas are Celt or Celtiberian. The pink areas are Iberian. Greek settlements are bright teal and Phoenician are tan and on the coasts. The Lusitanian tribe in what is now Portugal and the Vascones of the mountainous north were already linguistically distinct from surrounding language groups. Rome wished to expand its power in the Mediterranean starting from Sicily, partially controlled by the Carthaginians. For over a century in the Punic Wars, Rome fought with Carthage over control of the Mediterranean and its colonies, with each state ultimately fighting for its very survival. With the impetus of the struggle with Rome, the Carthaginians expanded their colonies in Iberia, often forcing the Celtiberians to ally with them. Rome finally defeated Carthage in 146 B.C.E., burned the city to the ground and sold all its citizens into slavery. Through the course of the Punic wars, Romans invaded Carthaginian colonies. 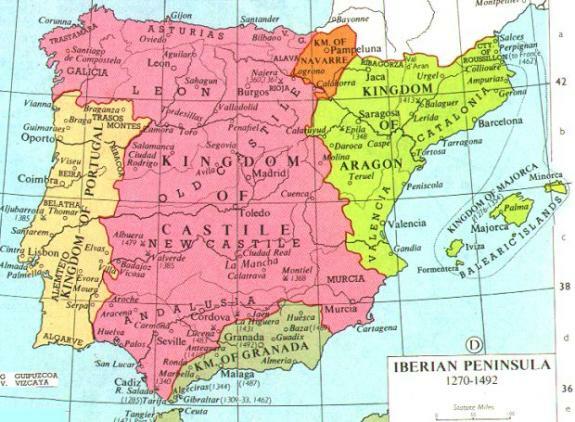 They eventually took control of the entire peninsula they called Hispania. In 192 B.C.E. they took Toledo, but the conquest of Hispania took many campaigns more. The ruins of Numantia in northern Spain bear witness to the brutality of the Roman conquest and the resistance of the Celtiberians to submission: the citizens of Numantia chose in 133 B.C.E to kill themselves rather than to surrender to the Romans. 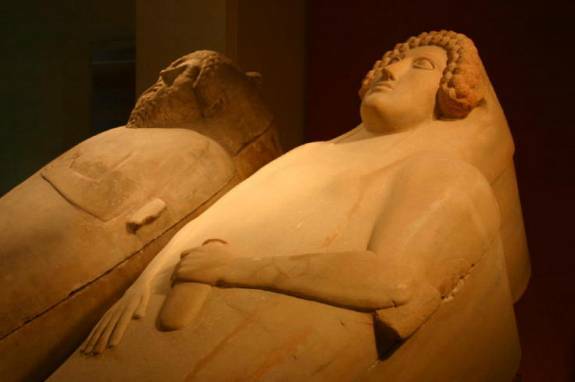 The Romans controlled Hispania for more than 500 years: from the second century B.C.E. until the Roman Empire began to fail in 409 C.E. In spite of the cruelty and harshness of their conquest of Hispania, the Romans saw themselves as bringing the benefits of civilization to a country of disunited and savage barbarians, an image of Iberia disseminated in the histories written by Herodotus (fifth century B.C.E. ), the Greek "father of history." The Romanization of Spain was more thorough in the south and east of the peninsula and less successful in the north (Cantabrians and Vascones resisted Romanization). The Romans organized urban administrative centers and built public works such as roads, aqueducts and amphitheaters, many of which survive to this day. The Romans incorporated members of the Celtiberian nobility. Two Roman emperors, Trajan and Hadrian, were born in Hispania. Of course, the most obvious evidence of the tremendous influence of Hispanoroman culture in Spain is the Spanish language itself. The history of the Jewish people of Spain dates from the Roman era, although their history of trade with Spain goes back even further. The Jews suffered the destruction of their temple and expulsion from Rome; many resettled in Hispania, where they had long-established trade relationships. As Roman citizens, the Jews participated in civic and economic life. They were heavily engaged in commerce and agriculture and enjoyed relatively close relations with their neighbors, forming the largest and most prosperous Jewish community of the time; numerous synagogues and archeological evidence provide testimony of their presence and influence in Spain. This is not to say there was no discrimination against the Jews; as early as 300 C.E. there were edicts setting forth harsh penalties for adultery with Jewesses or even for sharing a meal with a Jew. The Jews of Spain spoke a language known as Ladino, a mix of early Spanish and Hebrew, which the Sephardic Jews, their descendants, still speak today. A postage stamp commemorating the ancient synagogue of Cáceres, a city founded by the Romans 2000 years ago with the name of Ceres. When Rome began to lose its grip on power, Germanic tribes invaded the peninsula from the north. The Suevi invaded and occupied what is now Galicia in the northwest of Spain in 264 A.D. The Franks and the Vandals also invaded the peninsula. Rome appealed to the Visigoths to help preserve its hold on Hispania. By 419, the Visigoths had established control of Hispania and broke with Rome. 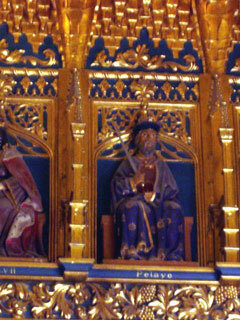 King Leovigild expelled the last of the Roman functionaries and established the first peninsular kingdom in Spain in 568-586. 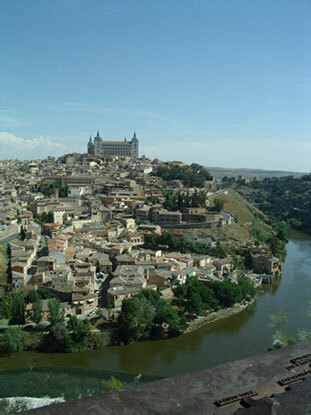 Toledo was the capital of the Visigoth kingdom, now called Spania. Though they brought skills in metalworking, for the most part the Visigoths adopted the cultural and administrative legacy of Roman Spain. It was during the reign of the Visigoths, and not the Romans, that Spania embraced Roman Catholicism: Leovigild's son, King Reccared, was baptised in 589. The Hispanoromans had largely converted to Catholicism by the early fourth century, even though the religion was still banned in the Rome. However, the Visigoths were Arians, followers of a non-Trinitarian Christianity common to the Germanic tribes of the time. With the conversion of Reccared, all of his subjects were compelled to convert as well. This marks the beginning of the identification of state and church that continued to be a characteristic of Spanish government well into modern times. The efforts of the Visogoth kings to impose religious unity on their fractious kingdom led to successive efforts to convert, expel or harass the Jews. Many Jews were forced to be baptised; these conversos often continued to practice Judaism in secret. Property Jews had acquired from Christians was confiscated and sold at a fixed price, ending Jewish participation in agriculture. Unconverted Arians who were also threatened by religious persecution were natural allies of the Jews; ironically the efforts to compel religious unity contributed to discontent and division in the Visigoth kingdom. It is striking in the history of the Visigoth kingdom to note how often the succession of kings was the consequence of murder. The fierce infighting among the Visigoth nobility and the discontent of their subjects with Visigoth rule probably accounts to a great extent for the ease with which the Moors were able to conquer Spain. In 711 the Berber Moors invaded from Northern Africa and handily defeated the Gothic kings. "Perhaps the most interesting legend concerning the Visigoths is that of their last king and the entry of the Moors into Spain. King Roderick developed a passion for Florinda, daughter of his friend and counselor Count Julian, who ruled Ceuta in Africa. Perhaps lacking in honor, the king used to hide behind a bush on the far side of the Tagus River each day to watch the innocent Florinda bathe. One day he lost control of his passions, leapt out, and raped the girl. Her father, Count Julian, understandably furious, seeking revenge and restitution, was ridiculed by his king. Plotting revenge, Julian fled Toledo to return to Ceuta, and invited the Muslims there north with him to help teach the arrogant king Roderick a lesson. He led the Moors into Spain, where they defeated Roderick, and then brought them to Toledo and taught them how best to overcome the defenses of the city. All that was ever found of Roderick, after the battle, was a scarf and glove: his fate was never known." 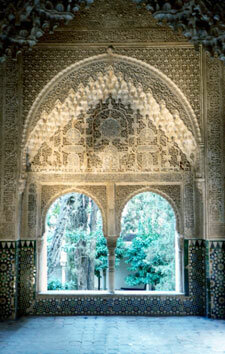 The Moorish period of Spanish history spans almost 800 years: from 711 to 1492. This period is also known as the "Reconquista," or "reconquest" because resistance to Moorish rule existed from its inception. The Moors controlled almost all of Spain; however, resistance spread from the North and the Moorish influence was stronger in the South. In 718, Pelayo founded the kingdom of Asturias in the northern mountains of Spain, where a Muslim army was defeated in the battle of Covadonga. This is the beginning of the "Reconquista," only seven years after the Moorish conquest. Although the "Reconquista" is a recurring theme in art and literature and a touchstone of contemporary Spanish identity, it was not a monolithic movement. Indeed, neither side, the Catholic nor the Moorish, was tightly united. There was a great deal of infighting on both sides as well as intermingling of the two sides. The Moorish occupation can be divided into roughly three periods: the early period of the Umayyad rule iindependent from Baghdad, the breakup of Muslim rule into independent kingdoms called taifas, and final period of Moorish disintegration and Christian predominance. The name Andalucia reflects Spanish history. The Vandals who occupied Spain (and were driven out by the Visigoths at the request of the Romans) had so dominated the peninsula that the Berbers called it Al-Andaluz, or the land of the Vandals. Later, the Moors used the name Al-Andaluz for the entire peninsula. Now the name of Andalucia is used only for the southernmost community of Spain, where the Moorish influence is most evident. The capital of Moorish Spain was Córdoba, which became one of the largest and most cosmopolitan cities of the age. In their expansion from Arabia into Spain, the Moors had synthesized and incorporated many cultures and brought advances in architecture, mathematics, music, poetry, philosophy, technology and medicine. They had preserved Greek and Roman texts that had been destroyed elsewhere by barbarian invaders, such as the philosophy of Aristotle and Plato, the histories of Herodotus and the medical texts of Hippocrates and Galan . The Moors imposed a tax on non-Muslims, but otherwise were relatively tolerant, so that Jews from less-tolerant regions in Europe and Africa flocked to Spain, bringing cultural enrichment from those areas into the mix. Christians and Jews lived in separate areas in the Moorish cities, but the Jews tended to participate to a greater extent in civic administration, medicine, scholarship and trade, especially in slaves. The slaves were usually Slavs; obviously, the word "slave" derives from this trade in Eastern people. Many of the new Moorish subjects converted to Islam in order to avoid the special tax; these converts were called "muladíes," while those Christians who continued to observe their religion while living under Moorish rule were called "mozárabes." 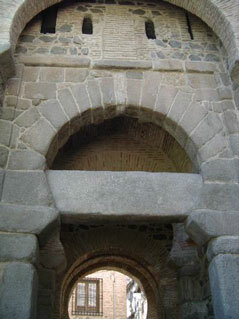 Mozárabe arquitecture displays Moorish influence in the use of brick, vaulted, ribbed domes and horseshoe arches, a form called "herradura" (horseshoe). 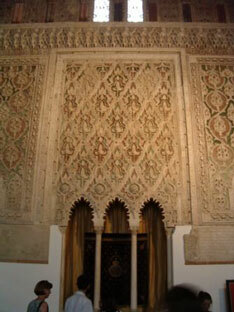 The art of the Moors who remained in areas reconquered by the Christians is referred to as "mudéjar." The synagogue of Toledo is an example of mudéjar art. The power struggles that took place during the Reconquista gave rise to several features of Spain that continue to be evident today. As the territory of Asturias expanded to the disadvantage of both Christian and Moorish kingdoms , other groups pushed back, establishing the kingdoms of Navarre and Aragon, while the Franks entered into what is now Catalunia. Even now the language of Catalunia resembles a mixture of French and Spanish, giving evidence of the Frankish background of the region. As Muslim Spain grew more fragmented, the Catholic side became more coordinated and continued to conquer territory. Muslim rule in Córdoba disintegrated in the 11th century with the death of the last Umayyad caliph, while the Christian kingdoms of Castile and León conquered Toledo in 1085. The fall of Toledo alarmed the Berbers, who renewed their struggle to hold on to their territories. Their chieftain was Yusuf ibn Tashfin, leader of the fundamentalist Muslim movement known as the Almoravids. From this point on, the Reconquista took on a more markedly religious character. 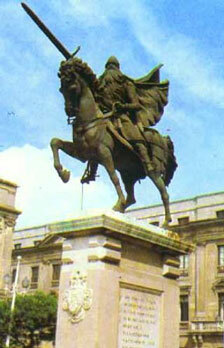 The epic and legends of the great Spanish hero El Cid date from this period. El Cid conquered the Moors in 1094 and maintained Valencia under Catholic rule until his death in 1099, when it reverted to Muslim rule. Valencia on the eastern coast is one of the most fertile parts of Spain, and is interlaced with irrigation canals constructed by the Moors that are still in use today. A statue of El Cid in Burgos, in the north of Spain. His sword is in the National Archaeological Museum in Madrid. 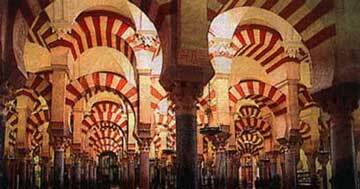 The magnificent mosque in Cordoba, built on the site of a Roman temple and a Visogoth church, is now a cathedral. 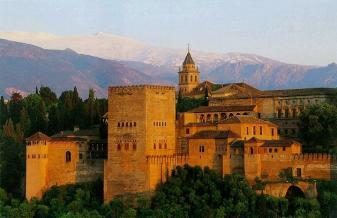 The Alhambra is a Moorish palace in Granada. Its austere exterior conceals a sumptuously decorated interior. Continual division in the Muslim ranks assisted the cause of the Reconquista. The Almohads, a second fundamentalist Islamic movement, arrived from North Africa in the 11th century to attack the Almoravids. As the Catholic forces pushed into Andalucia, Muslim Spain continued to disintegrate. Eventually all that remained was the wealthy kingdom of Granada, which finally was reconquered in 1492. With the union of the kingdoms of Castile and Aragon through the marriage of Ferdinand and Isabella, Catholic Spain was united. Granada finally fell in 1492 and the next era of Spanish history began. When we think of the people of France, England or Italy, we often think of them as the descendants of a particular tribe or nation (such as the Franks, the Anglo-Saxons or the Romans) who share a common culture. Obviously, this kind of thinking does not apply to the inhabitants of Spain, whose background is much more heterogeneous. pre-Neanderthal burial site in Atapuerca 580,000 B.C.E. cave paintings in Altamira 16,000 - 9,000 B.C.E. Defeat of Granada by Ferdinand and Isabella 1492 C.E. It is important to keep this in mind when becoming acquainted with Spain and in preparing to visit its historic cities and sites of interest. Spain shares with the United States the quality of being a multi-national country, drawing its character from the diverse elements that make up its population and its history. Familiarity with this background also aids us in remembering that there are a great variety of Spanish cultures and languages even today, and in understanding more about the political institutions and challenges faced by modern Spain.